In a race for “Best Wine Bar,” the locals have spoken: Postino is the winner. We love it so much we’ve already blogged about each location, in Arcadia and on Central. 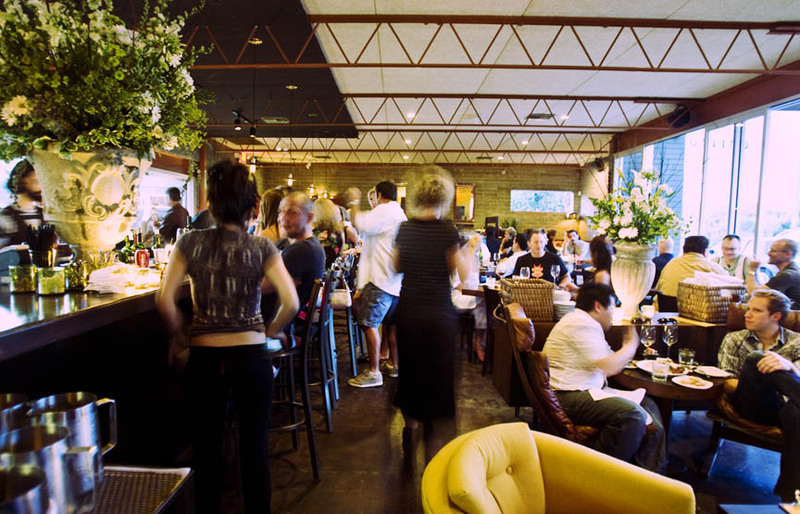 Up against some stiff competitors (including Edge Bar at Sanctuary and Kazimierz in Old Town Scottsdale), Postino flew to the lead spot, and it’s easy to tell why. Another location was opened on Central Ave. earlier this year and the neighborhood as welcomed it with open arms. Both places service the old Phoenix neighborhoods, with ranch houses, huge grass yards and trees arching over the streets. 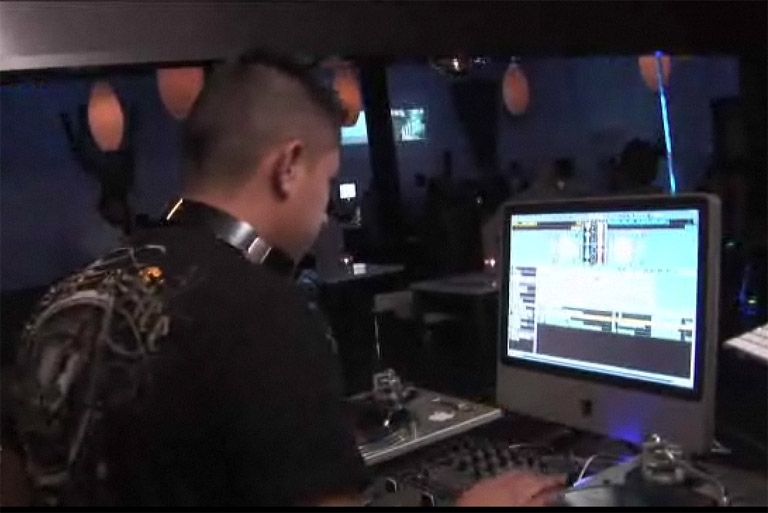 It’s the feeling of old Phoenix with modern swank. 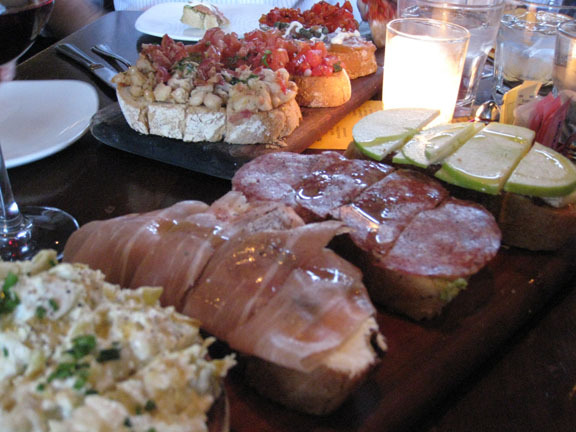 When you go, you must get the bruschetta, and eat one order for your meal or order a bunch and share with the group. We recommend the prosciutto with figs and marscapone, and the salami with pesto is perfectly balanced. You can’t go wrong with either. Matter of fact, stop yourself from diving in head-first. The burger. So easy to make, so difficult to perfect. But delux has risen to the challenge, and now you, our very own blog readers, have voted it the best burger place in the Phoenix area. When it opened a few years ago in a retail plaza on 32nd and Camelback (in the very nice Biltmore area of Phoenix), the amazing first-hand reviews spread like wildfire. The glowing [blue] reviews came pouring in. And quickly, it was the new it place. It’s the place locals go for lunch, dinner and everything in between and after. They’re open late, which means one of their milkshakes is never out of reach. And while the milkshakes are great, this is not your Americana novelty burger place. This is a hip, modern, New York-ish ambience with gourmet touches on your favorite foods. 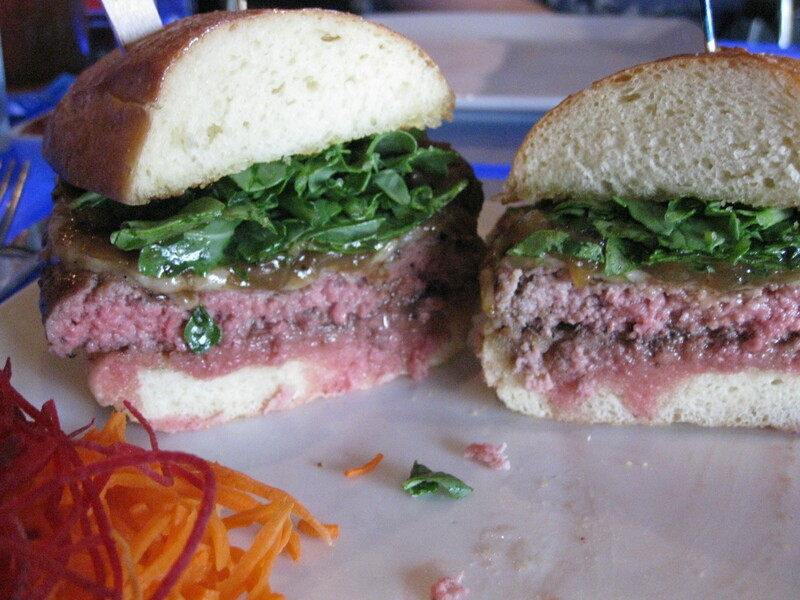 The delux Burger was one of the first in Phoenix to do the arugula-maytag and gruyere-bacon- carmelized onion thing, and they do it with many organic ingredients, and even use natural antibiotic-free beef in all their burgers. The grilled cheese is absolutely supreme, the salads are deep green, crisp, and filling, but whatever you have, you must get the side of fries. They are the best. I prefer the mix with sweet potato fries (they are savory, not sweet), and they are a staple in my order. But nothing pairs better than their beer on tap, which is extensive. I recommend their flights, and since I have a sweet tooth, I go for the #3, which is light beers and ciders, but they have the uber-strong, husky pours as well, so don’t be shy. Saddle up for some dessert too. Their lava cake is amazing, but they’ve put a halo on it. A banana split halo. Surrounding the ganache-filled lava cake are heaps of natural ice cream, whipped cream, bananas, and they let you be the pour master of the hot fudge. 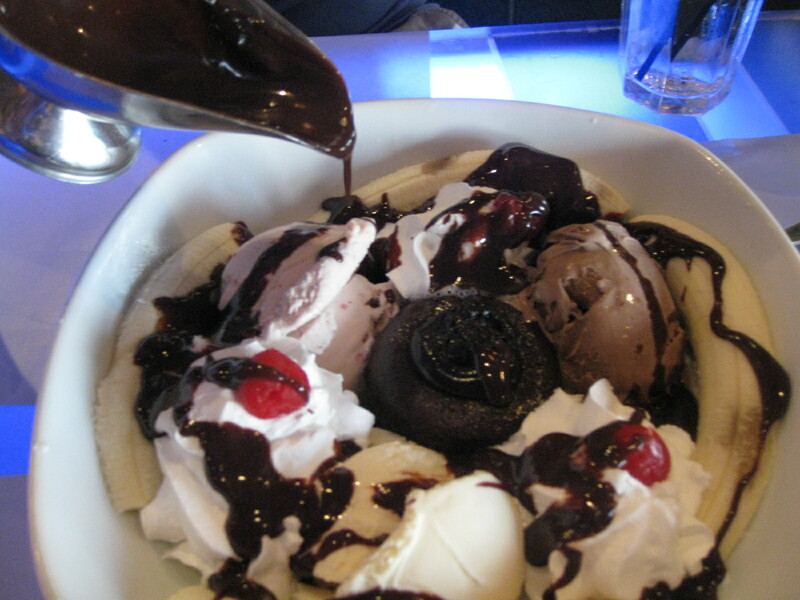 This – the banana split lava cake – is enough for four people, so bring friends. 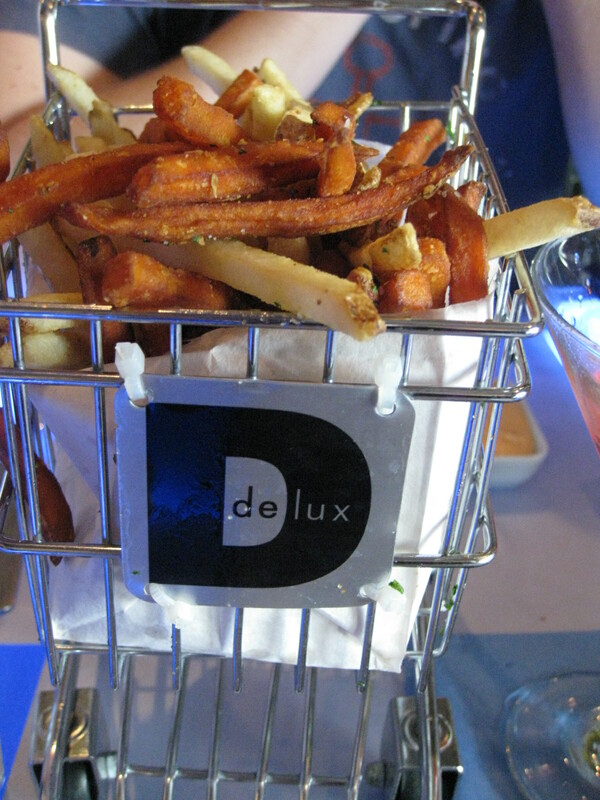 delux is open until 2a.m. (the grill, too) every night (err…morning). For most of the year, their patio is enjoyable, but to get the vibe, sit inside. Because breakfast seems so simple (it’s just a couple eggs, right? ), that’s what makes it so difficult. Everyone, every city has those few places that are MUST-GOs. We put the power to the people, and let them vote on Phoenix area favorites. Between Orange Table, The Breakfast Club, Morning Glory Cafe, and Over Easy, Matt’s Big Breakfast climbed to the top of our “Favorite Breakfast Place” poll. And for you loyal blog readers, you may be thinking, “They already wrote about Matt’s Big Breakfast!” What’s a blog to do. 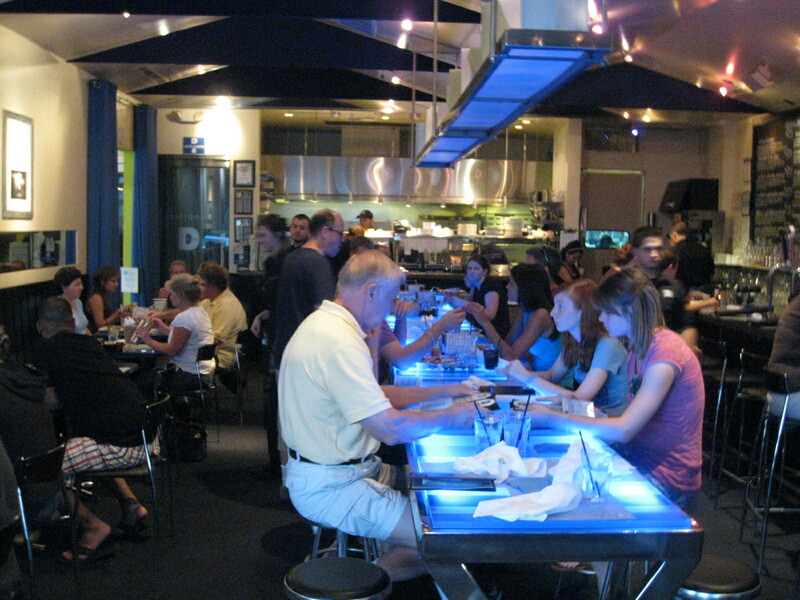 Matt’s is owned by Matt and Erenia Pool, also of Roosevelt Tavern success, and has been featured in every local publication and the famous Guy Fieri on “Diner’s, Drive-Ins and Dives” on Food Network. Among all the accolades, the line of loyalists every morning waiting outside is the best testament to the deliciousness. A picture is worth a thousand taste buds. But good food is one-part recipe and one-part ingredients. 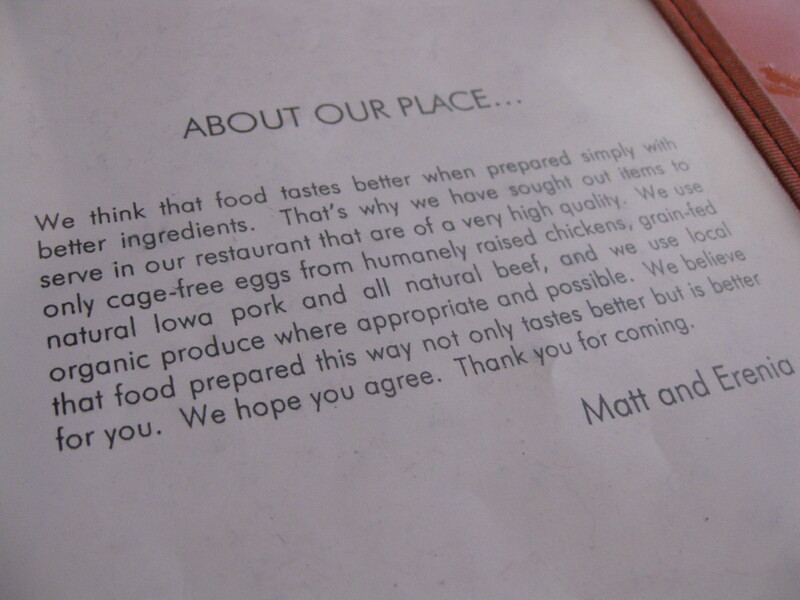 The local prduce, jams and jellies, natural beef and meat, and the cage-free eggs are so rich with flavor, that when combined with Matt’s magic wand, it easily becomes a local favorite breakfast joint. Advice: When you go, get the waffle. 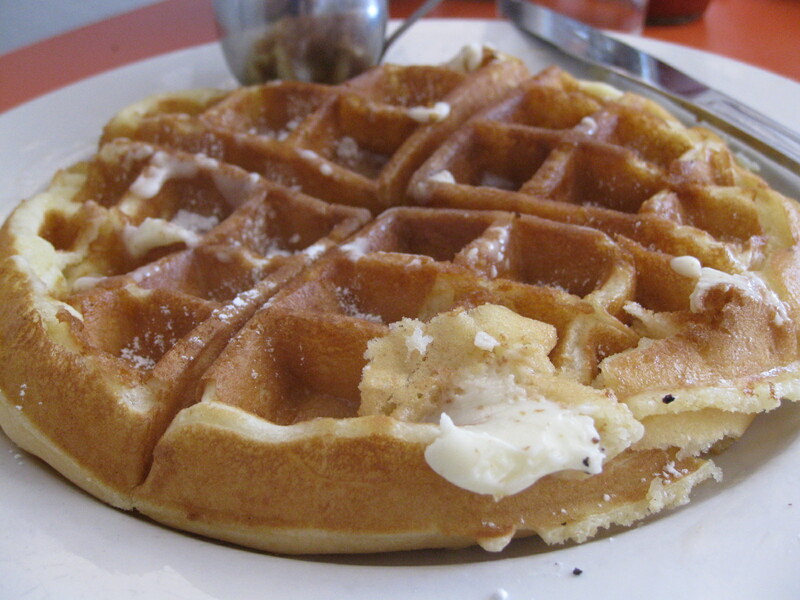 Get the waffle as an appetizer, a side dish, dessert, anything. You must have it. Leave no waffle behind. In this economic time, everyone could use a good waffle (that’s my final appeal). Advice #2: Get extra syrup. And a straw. It’s that good. Advice #3: Go for lunch on a weekday and avoid waiting, even though it’s worth the wait. 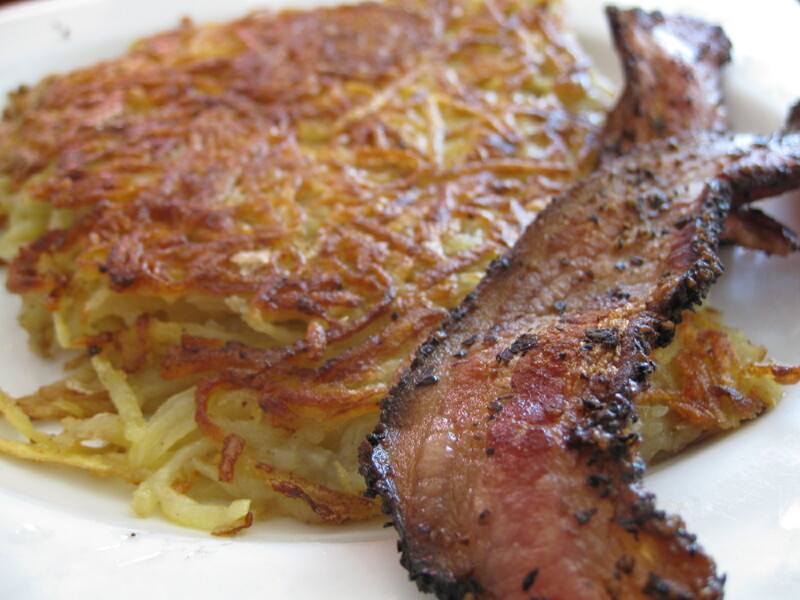 Take it from the locals and make Matt’s your new favorite breakfast place! Hello, Guacamole. Hello, Margarita. Hello, Good Time! 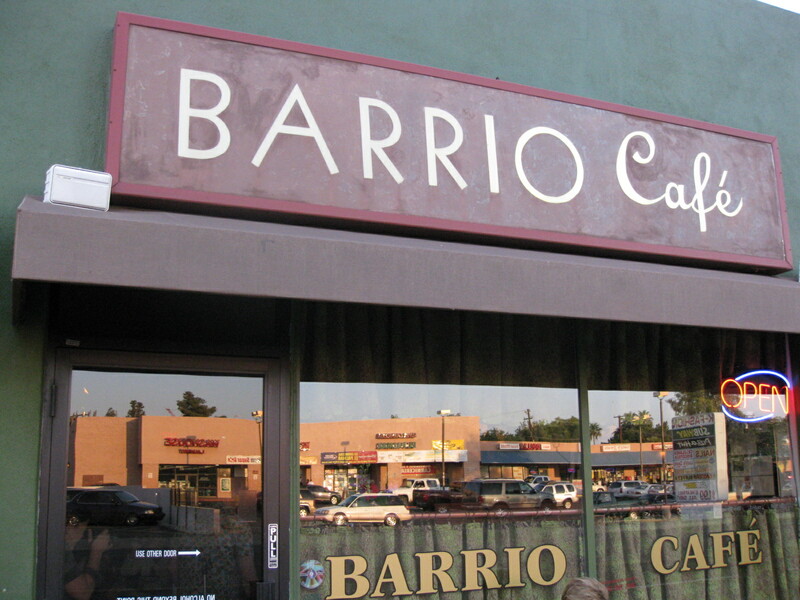 You voted Barrio Cafe as the Best Mexican Restaurant in the Phoenix area, and we agree! 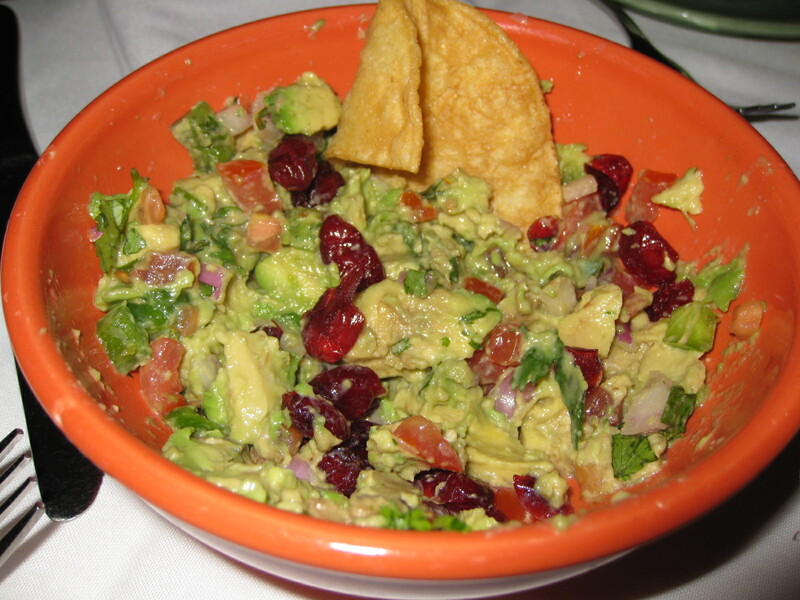 Barrio is known for many things, including the tableside guacamole, the but most of all – the food. Locals will line up for an hour or more to be seated at one of the tables in the quaint room of Barrio just for the amazing flavors and combinations that they offer. Started by Chef Silvana Esparza in 2002, Barrio quickly became THE place to go. Maybe it’s the “Filete de mi Tita,” filet mignon with Mexican style crab, longaniza and Ancho chile sauce dripping over the top. Or maybe it’s the “Pollo en Mole,” with the most delicious red or black mole you have ever had – so flavorful, light and smooth. Maybe it’s the “Pescado del Mar,” which is this tower of halibut, shrimp, scallops, crab and lobster, with a white wine and shallot cream sauce, chorizo and poblano peppers. How she marries these flavors together is amazing to me. Then again, her sauces can’t be beat. Everything is just enough spice, but not too much heat. Barrio’s creations hail from Southern Mexico, so the jalapenos and peppers that override the flavors in most traditional Mexican places are absent. 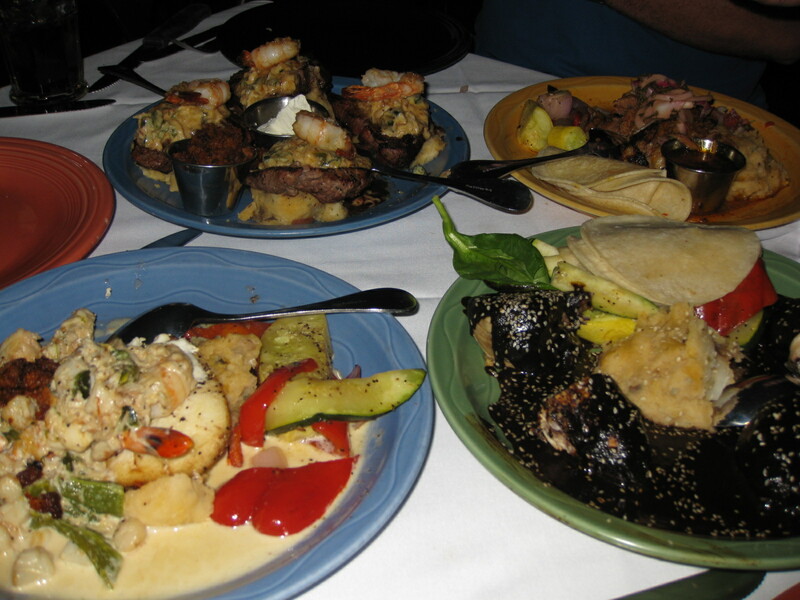 Barrio is not your normal beans-and-rice Mexican food, but rather an energetic, gourmet incarnation of Mexican cuisine. Not to mention, a treasure in the heart of Phoenix. 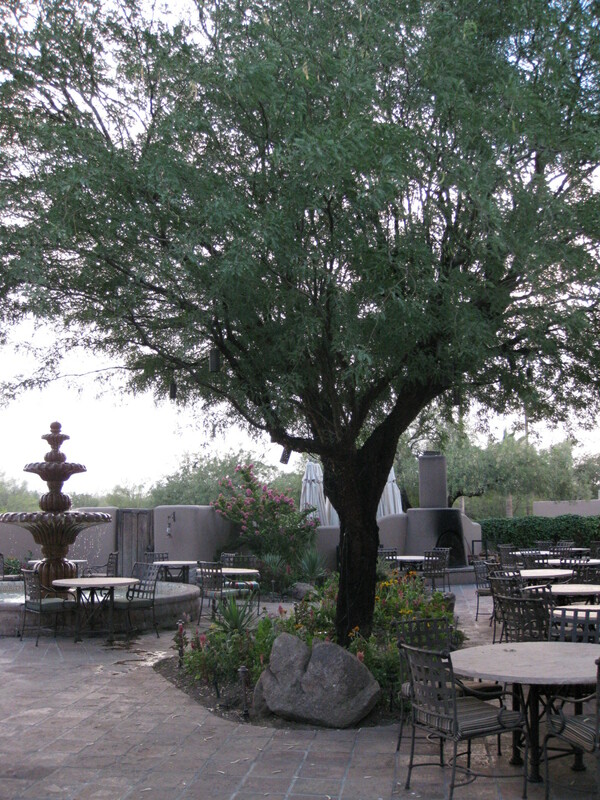 You voted Lon’s as the best patio in the Phoenix/Scottsdale area, and we couldn’t agree more. Though I’d argue, it’s one of the best restaurants the Valley has to offer. Sitting in the former home and studio of artist Alonzo Megargee, there is a rustic elegance, where the servers wear jeans but the patrons wear dresses and slacks. The cuisine and history command respect, and one bite in, you realize what is so special about this place. 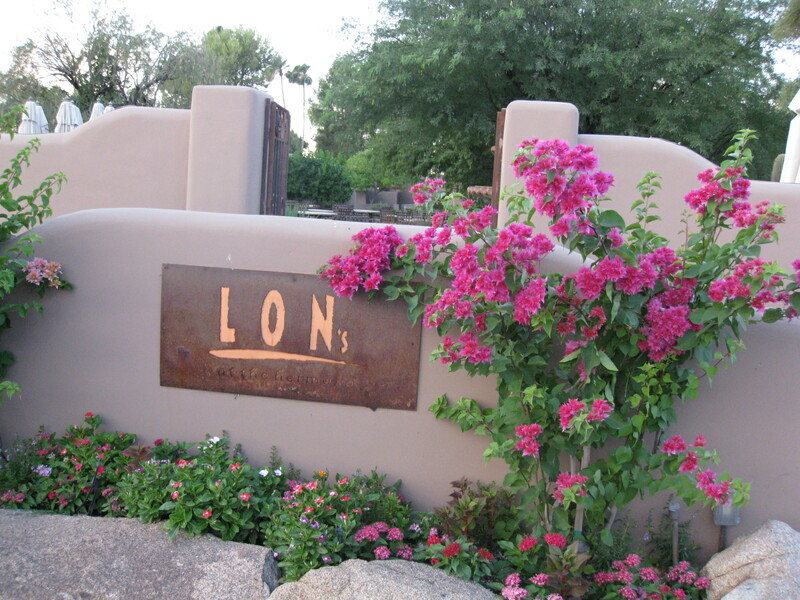 Lon’s is at the Hermosa Inn, a quiet boutique-type hotel in Paradise Valley, so quaint and tucked into the landscape of centuries old palo verde trees, saguaros and creosotes, that without GPS, you’d nearly miss it. Lon’s is deemded an authentic hacienda – one of the few remaining in Arizona – but the views from the patio are completely unique. With seats under the stars, next to the fireplace or the melodic fountains, you look onto the northwestern hump – or the head – of Camelback Mountain. The Praying Monk is clearly silhouetted, the red rocks illuminate at sunset, and then they bring the food. It’s one of those places where everything is their signature, but there are a couple dishes that will really blow your mind. 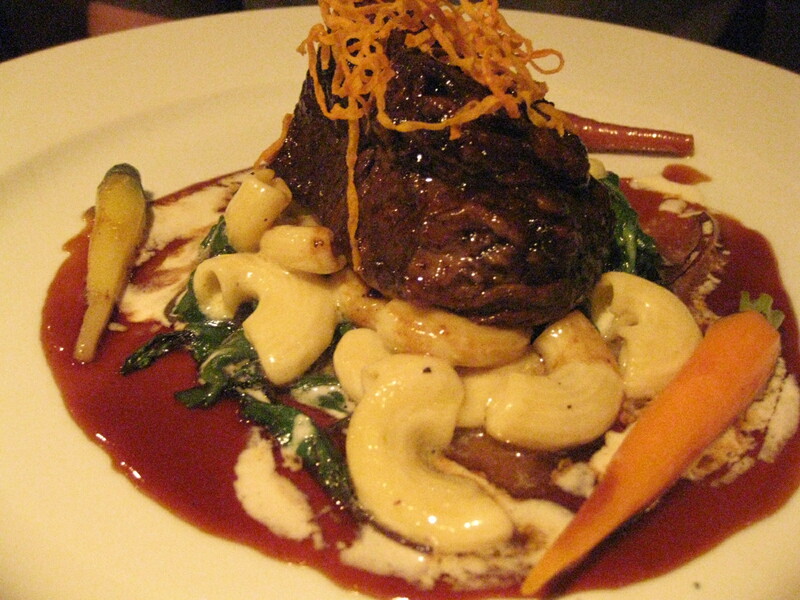 The natural braised beef short ribs come both as an app and an entree – they must know they are in high demand. They melt into your mouth, and the mac ‘n cheese with truffle oil is showstopping. 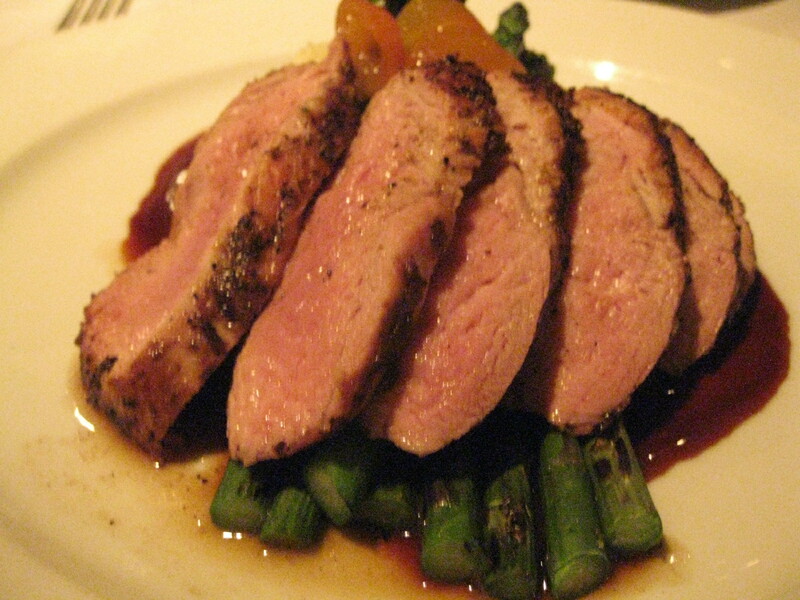 My other favorite is the two pepper roasted pork, with the chutney and citrus butter asparagus. The bar, restaurant and patio are all like vignettes – everything seems quiet, private, and comfortable. I highly recommend it to celebrate a special occassion or a quiet dinner to relax. 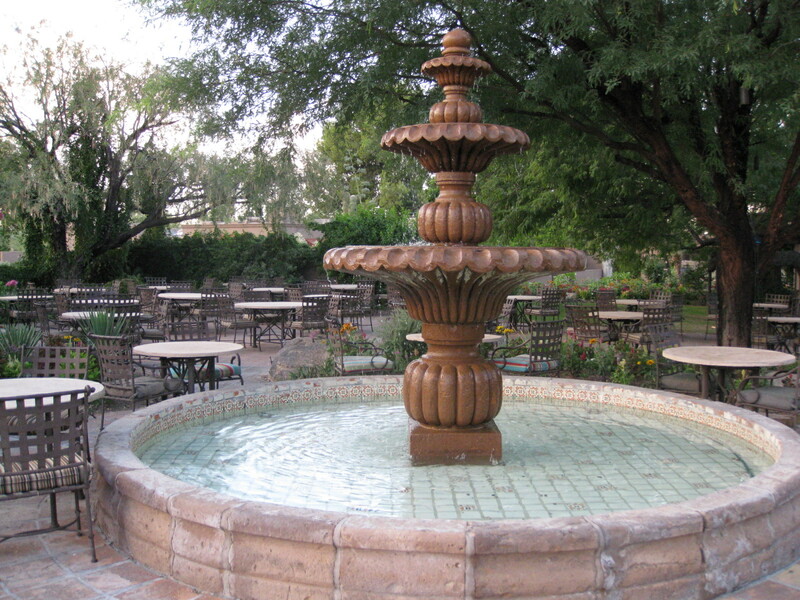 Just take it for the locals who voted it as the best patio, Lon’s is the place to be.